This comment was posted to reddit on Jan 23, 2015 at 9:26 am and was deleted within 4 minutes. 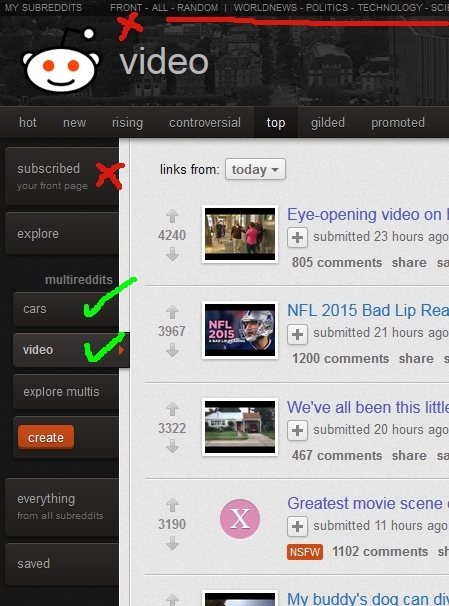 What this does for me, is that I have two multireddits (Videos and Cars). When I click either of them on the reddit side panel, the default link is replaced with the link which goes straight to top, which means they will default to the top sorting every time. The reason why you can't do it on "Front" or any other subreddit really, is because if you replace every instance of "reddit.com" with "reddit.com/top", it will screw up all links on the site. Every time you see a normal link on reddit (e.g., reddit.com/r/worldnews) the script will replace the link with reddit.com/top/r/worldnews" which doesn't make sense and will 404. I assume XPathResult can only be used with Firefox, so a Chrome equivalent needs to be used. Once again, I have no idea what I'm doing, but this is better than nothing for me. How to make the text bigger disable chat? Cannot upvote! Another account suspended How do I complain about unfair actions of a particular moderator? How objective are admins, and how fast do they respond? (([email protected])).. Chelsea vs West Bromwich Albion.. Live.. Stream.. Soccer.. Barclays Premier League.. Online.. Free.. West Bromwich Albion vs Chelsea Live..